the logic behind educated buyers homing in on Rhodes 22 sailboats. 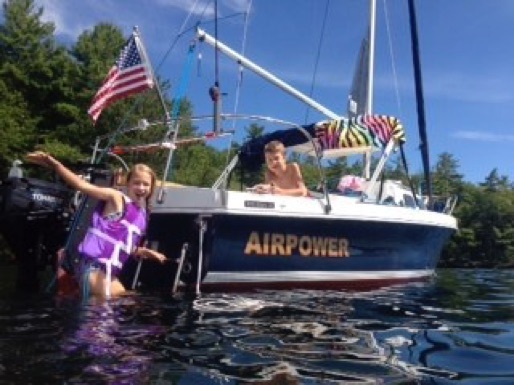 experiencing the ultimate blast of small boat sailing, with big boat amenities. our small facility, wander through the Used Rhodes Corral, sail the Albemarle. E-mail us when you are coming. ...to triumphantly enter Huntington Harbor on the North shore of Long Island, NY. For the beginning of the rest of the Rhodes story go to the bar atop this page and navigate away. 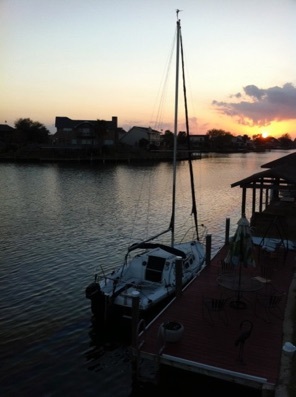 BUT, as long as you are here, here a Texas Attorney and a Naval Architect, both two time Rhodes recipients, tell friends and a boating publication, their thinking in going for a second Rhodes sailboat. A peek at owners e-mails and shoppers replies can be fun, educational and, ultimately, extremely rewarding.You will be able to do this kind of targeted eavesdropping throughout these pages. 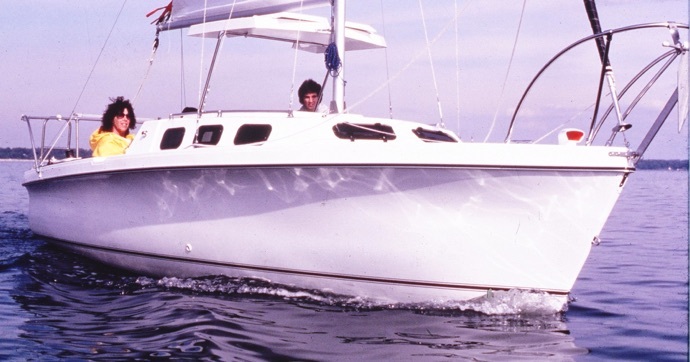 The requirements list started with the desire for a boat capable of accommodating, comfortably, two for two nights or more, four for occasional overnighting, and day sailing up to six. trailerability was necessary to reduce the complexities and expense and to allow excursions to new waters. Stability and performance were as important as comfort and had to be balanced against the need for shoal draft. Shallow Barnegat Bay would be the prime sailing area. I had no desire to race but wanted a racing sailboat’s abilities to make it up wind, in light breezes with a responsive helm. As a navel architect the first major decision point concerned the underbody configuration. A straight centerboard boat was rejected as it can offer only form stability and the relatively inefficient use of ballast inside the hull. The swing keel and drop or lift keel configurations were also rejected, as the thought of a moveable 500 pound items being responsible for the ultimate stability and performance of the boat made me uncomfortable. Further, with the keel raised, the boat would have virtually negligible sailing ability. Thus, it became clear that only a keel/centerboard boat would match my requirements. 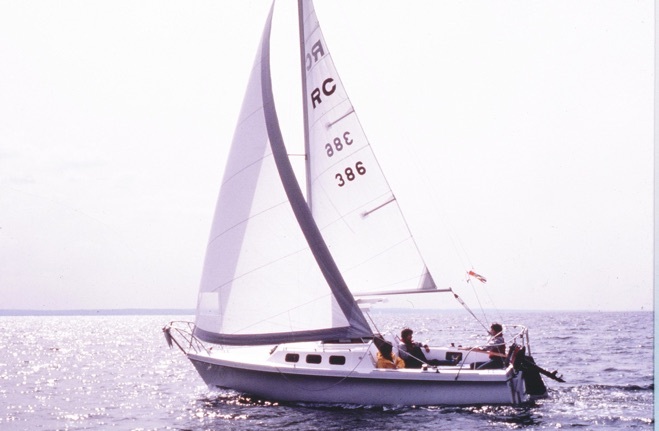 I developed a list of approximately 30 keel/centerboard boats. The hull dimensions, sail areas, various calculated form coefficients and ratios and the number and location of adult sized berths. Pricing information was obtained in order to insure a fair price comparison between boats. Other non-quantifiable characteristics were summarized such as the amount and quality of storage and the location and layout of the galley. These facts served as a starting point. Things like how well the boat sailed, the quality of construction and the competence and honesty of the builder could only be determined by talking to others and making the rounds of the boat shows. The “Other Opinion” service of Cruising World was a useful source of information. The list was narrowed down to six boats. Some fell short but were included because they looked so beautiful. We arranged test sails and made our choice. There are three characteristics that I look at: aesthetics, sailing ability and comfort. Although a number of people have complimented the looks of the Rhodes, I do not think it is attractive. My taste tends to Carl Alberg’s Cape Dory Typhoon. The sailing ability of the Rhodes is excellent; fast, stabile and responsive, making the learning process easy. The Rhodes 22 is the most comfortable sailboat for day sailing and cruising on the market in her size range. The single most striking feature of the boat’s layout is the size of the cockpit: Its length and width is equal to or greater than many larger boats I have sailed. It is perfect for comfortable sailing and lounging even with a crowd aboard and makes into a berth that is 7 feel long and 5 feet wide. Sail handling is very well organized with both sails a snap to handle even with the crowd aboard and there is more storage space than a sensible sailor can fill. The cabin has a long galley area to the starboard with built-in sink, cooler and stove. A settee to port is laid out so that a person can sit back and relax without staring at his belly button and it converts to a double berth. A portable table can be moved to the cockpit. Forward is the obligatory V-berth, and, the Rhodes has a fully enclosed marine head system. The cabin top includes a pop top that provides standing head room. The construction of tis item is superior to the many others I have seen on the market and has bee trouble free. 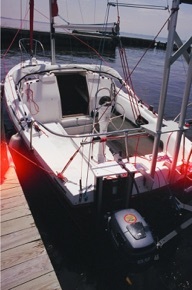 The mast is supported by 6 shrouds and 3 stays: 2 uppers and 4 lowers; a double back stay and the forestay. This seemed like a lot of wire to me but the shrouds actually make raising and lowering easier. The 2 upper shrouds and forward lower shrouds are positioned such that the mast can be handled without the fear of its falling to the side. Although the mast is larger than that on our previous boat, we find the Rhodes 22 easier to rig. A LA attorney just took delivery of his third (3) Rhodes. No, he hadn’t sold the other two. Was he going into the sailboat business on the side? No. He just wanted a Rhodes to be there, ready to sail whenever he ended up in any of his sailing haunts.